If you are looking for a bright and colorful toy that your baby will just absolutely love, there’s no better choice than the Little Playzone – a product of Friendly Toys. This little play zone, completed with electronic lights and sound, is a sure way to keep your child occupied for hours, as well as give them immense joy and pleasure. 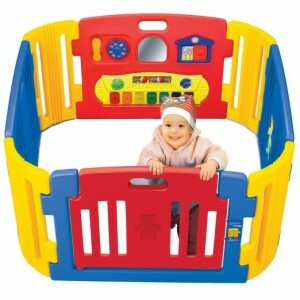 The Friendly Toy’s Little Playzone is a perfect combination of affordability and choice that can be set up in any room of house to provide a safe playing zone for your toddler or infant while keeping you occupied with your own chores and routines. The Little Playzone by Friendly Toys is a unisex product which displays a rainbow of colors that children of both genders can enjoy. 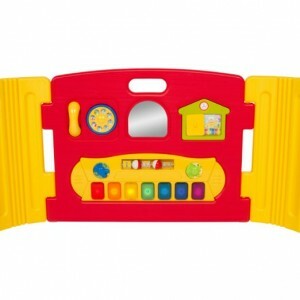 Beside the bright colors, the toy – unlike other play zones that are only barriers for the children to stay inside – contains a number of toys that the child inside can play with to occupy their time, including mirrors, a picture house, spinning balls, a toy phone and a musical keyboard that lights up when played with. This play zone is ideal for any child from 6 months of age, and will surely become a favorite of any child because of the interactive and stimulating activities that it provides. The Little Playzone is perfect to be easily set up inside the house or outside, and can be equally entertaining to an infant or a toddler. The Little Playzone is just the right size that is comfortable for the child to stay inside and to be set up in any empty space around the house without crowding other people. The play zone, providing a space of 13 square feet, can easily accommodate a number of children – which is ideal for a play date – as well as a few adults without anyone feeling cramped. 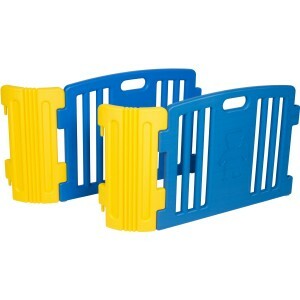 Extra connectors are available that can make the play zone bigger for those who have more space in their homes, or for those who have more than one child to play inside it. However, in many cases, instead of adding extensions, some parents prefer to connect two play zones together to make double space for their child or children to move easily inside. Certified by the ASTM and the CPSC for child safety, Friendly Toys’ Little Playzone can be considered one of the safest play zones available for children of all ages. Even if the child in question is extremely active and strong, toddlers over 2 years old cannot topple over the toy and injure themselves. This toy also has a childproof lock that only adults can open, so there is no chance of your child being able to slip outside if they want to. Also, despite the sturdiness, the entire toy is light in we ight, and can be carried around from one place to another without a problem. There is no on/off switch for the music and it can only be stopped by removing the batteries. The music has been considered a little loud for the delicate ears of very young children, and some parents prefer to take out the batteries before letting their children play in it. Moving the toy from one room to another requires dismantling the whole toy and then setting it up again – an action that is easy but takes some time. Friendly Toys’ Little Playzone has been rated 4.3 stars out of 5 .